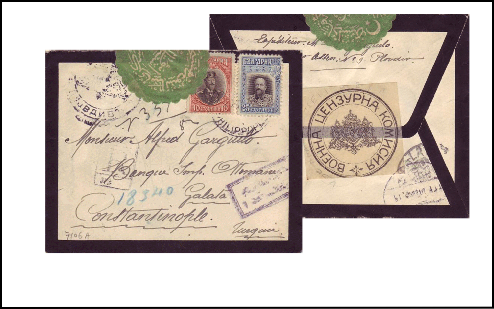 Mourning covers can be defined as black-edged posted letters used in most countries, especially during the 19th and early 20th centuries, as harbingers of death and messengers of grief. These death related letters are characterized by a mourning mark, almost always black, and have been carried in the public mail system of at least 250 different countries. The MSCC was founded in 2006, and has an international membership. It publishes a quarterly newsletter of approximately twenty pages entitled Mourning Notes, available by e-mail in color or by regular mail in black and white. Meetings of the club have been held at various conventions of the American Philatelic Society and the Royal Philatelic Society of Canada, as well as at smaller regional exhibitions. 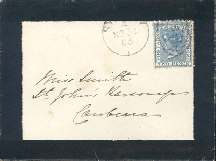 24 Nov 1883: Sydney to Canberra, Australia. 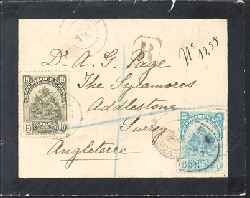 The Mourning Stamps and Covers Club (MSCC) promotes the association of mourning stamps and cover collectors in activities conducive to the common growth in knowledge and enjoyment of all aspects in this field of philately. This feature is one of many articles published quarterly in the Club’s Journal Mourning Notes and is included with membership. AND…you can access a list of articles from the current issue.